Signature collections enable admins to prepare a curated list of signature templates from which the users will choose their signature design themselves. Before you start putting together the actual collections, make sure you've prepared a variety of signature templates you'll use. Go to Settings > Signature collections and click Add new. After you create the collections you'll be able to manage them from this screen. The collection name won't be visible to users, only to admins, however, the signature template names will. You can use this to your benefit and squeeze some information about the template to its' name. 4. Now click on Add. Congrats, you've prepared your first collection! 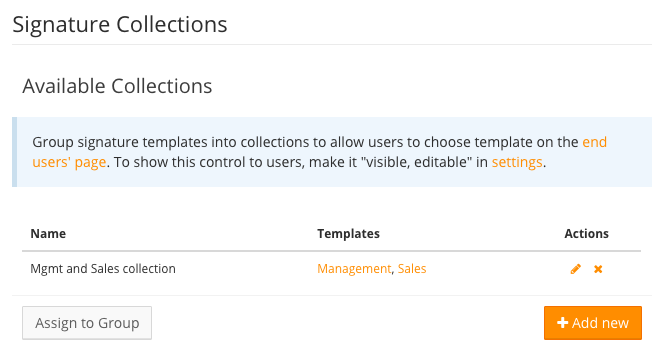 You now need to assign the collection you created to a specific User Group - the mebers of this group will be later enabled to choose from the templates in the collection. In Assigned signature collection choose the correct collection. You can also disable collections for the specific group or choose the blank option - that will cause the group to inherit the collection settings from their parent. The "inherit" option is chosen as default so if you set a collection to a group, it;s possible this will influence its' subsgroups too. It's also a good idea to assign one template for the group that will be applied unless the user chooses a different one from the collection. After you've prepared everything, the next step is to enable them for your users. Change the option for collections from Hidden to Visible, editable. If you don't do this, you will still be able to assign a specific template to a user as admin, but your users won't. If they click on Select signature template, they'll be given the curated options you've prepared for them. After the users confirm their choice, it will be saved. If they click on Request a change button, the admin will be notified and can push the changes to their Gmail. If you have subscription (or believe that the users won't make frivolous changes that will cost you credits), you can even enable them to push these changes themselves.